“Due to native graph storage, the Neo4j queries run really quickly, which is amazing,” said Andrés Natanael Soria, Senior Software Engineer at Cablevisión Fibertel. The company uses a broadband network to provide cable television and internet services to customers throughout Argentina, and found the capabilities provided by graph databases to the be best tool to detect and prevent system failures. 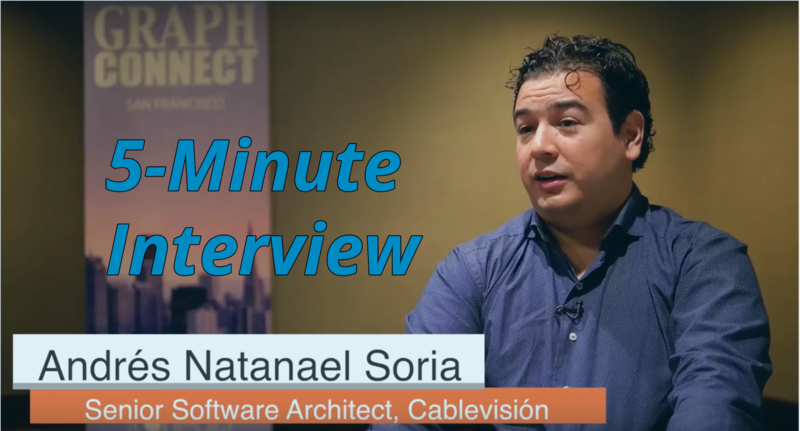 In this week’s five-minute interview (conducted at GraphConnect San Francisco) we discuss all the ways in which Cablevisión uses Neo4j — in conjunction with a robust software architecture — to provide seamless cable services to customers. Tell us about what other technologies you integrate with Neo4j at Cablevisión. Andrés Natanael Soria: We use Neo4j with our Hybrid Fibre-Coaxial (HFC) information system project to execute different kinds of important impact analysis queries that allow us to determine the root cause of any performance issues. We use this in conjunction with Docker to support our Neo4j ecosystem, and have some real-time processing software like Apache Kafka with Spark, and so on. Soria: My favorite thing about Neo4j is Cypher because it’s a powerful way to search for different kinds of patterns in our data. Due to native graph storage, the queries run really quickly, which is amazing. Those kind of features really make the difference. Additionally, database performance remains consistent regardless of data size, which is amazing when compared with other kinds of databases. For example, in directional SQL we had to use 10 to 20 lines of code that Cypher can perform with just a few lines. Can you tell us about some of the ways you use Neo4j? Soria: We use graph recommendation engines for fraud detection with the integration of real-time events through Kafka. We will also dispatch some events directly to Neo4j to increase the cluster size automatically, monitor the traffic of the different events, and manage the size related with this. We have another usage of Neo4j with rapid network failure detection, which detects failures earlier and prevents them from happening in the future. Another positive feature about Neo4j is that it’s design-centric; first you focus on the graph data model design, and then execute different kind of queries in the database. I think that it’s one of the most powerful things about Neo4j.